Last night I had to drop Dana off at the Albuquerque International Airport. Our little adventure together had to come to an end. If you ask her she will say, “because one of us has to have a real job,” I think she just wants to avoid the 1600 mile drive. Friday morning she started getting text messages showing a delayed fight. Oh did I mention she was flying out at 11:59 PM on the red eye? Six hours before her flight and she knew it was delayed. After a long drive from Silver City to Albuquerque via Hatch NM, yep the chili pepper city, I dropped her off and then headed to Belen NM. I work up Saturday morning in a Church Parking lot awaiting the start of the Tierra Del Sol Road Race. The Masters 45+ field was the largest of the day with about 30 starters. The course was a 47-mile course that formed almost a perfect triangle and climbed a little over 1400 feet. Which for MABRA standards it would be a relatively flat course, except Belen NM is already at 4800 feet. For a sea level guy, I was a little concerned. 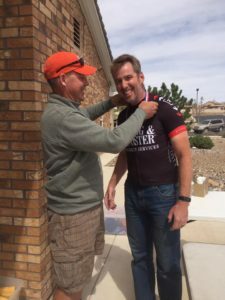 There were a few local teams 505 Cycling/Sports Systems, High Desert Bicycles Racing, and Squadra De La Pista represented with three or more riders. Seeing the teams, I decided that I would do nothing the first half of the race. I just sat in and conserved as much energy as possible. With about 10 miles to go, I moved to the front five of the race. I knew if two or three of the mentioned teams above got a rider up the road then they would only block. For the next 8 miles that is exactly what happened. All three teams would send a rider off the front, I knew if a break went it would stick, so I made sure I was always this them. With about two miles to go three of us got a little breathing room for about a mile and then we were reintegrated. One additional attack and I was sitting second with 1000 meters to go. 200 meters to go and it was a final surge. Two riders from High Desert Bicycles went by being trailed by a BMC guy (I think) with one in tow. I squeaked out fifth for the last step on the podium. Honestly, I lost a little focus on the last 1k. The 200-meter line came up a little faster than I thought, and I was a little slow on starting my sprint. Lessons learned. Looking at the numbers the race was kind of fast. We covered the 47 miles just at 1:51 at an average speed of 25 MPH. After the race, packed up and drove to Amarillo Texas and pulled into a Petro’s for the night.